Although it’s Citizen Kane that’s frequently cited in most critical reviews of Paul Thomas Anderson’s brilliant masterpiece There Will Be Blood (which was just named the Best Picture of 2007 by the National Society of Film Critics), Anderson has said that the film that inspired him the most was John Huston’s The Treasure of the Sierra Madre. “All of life’s questions and answers are in” the film, according to the director who was so influenced by the Bogart vehicle that the Internet Movie Database reports that he repeatedly put the film on at night before he went to bed just to fall asleep to it while he was working on the screenplay. As a jumping off point, Anderson used the first few chapters of Upton Sinclair’s 1927 novel Oil!, which he’d purchased when he was homesick simply because it had a painting of California on its cover (IMDb) and later sent the unfinished script to the man for whom he was writing it, Daniel Day-Lewis. As his producer JoAnne Sellar reported to Entertainment Weekly, There Will Be Blood may not have even been made if the reclusive Academy Award winning actor had declined the part but drawn to the film’s title which takes its name from the Book of Exodus, Daniel Day-Lewis agreed. Despite suffering broken bones on the second day of the film’s shoot, the actor turns in his finest performance in years and commands the film in a way that makes one instantly aware that without Daniel Day-Lewis, the film would fail to have the same level of impact it does from the get-go. Opening with Paul Thomas Anderson’s trademark of a constantly moving camera (IMDb) with what feels like over ten minutes of action without dialogue, we’re immediately transported to another time and place similar to Terrence Malick’s Days of Heaven, as we watch gold prospecting Daniel Plainview (Day-Lewis) risk limb and life trying to eek out his fortune when suddenly he strikes oil. It's all exquisitely photographed by frequent Anderson cinematographer Robert Elswit (Michael Clayton, Good Night, and Good Luck) and filled with nearly dance-like long takes cut together by editor Dylan Tichenor (Assassination of Jesse James, Royal Tenenbaums, Brokeback Mountain). The film’s classically stylized introduction, which is in stark contrast to the fast-moving, poetically narrated opening of Anderson’s Magnolia is heightened by a nearly Kubrickian 2001 like score by Radiohead guitarist Jonny Greenwood whose haunting dissonance-filled yet unforgettably expressionist musical accompaniment gets viewers completely lost in this conversation free world. However, now with the benefit of a successful oil business behind him, we along with the characters onscreen are jolted by Day-Lewis’s opening monologue to the “ladies and gentlemen” from whom he’s trying to procure land. 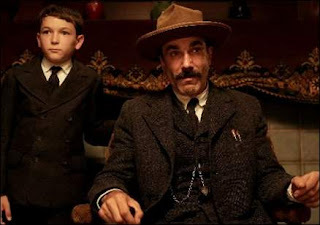 Filled with the unique and commanding yet surprisingly polite cadence that only Day-Lewis can bring to the role, we realize at once that his ambition and greed will bring about his downfall in a film that spans a few decades in the life of the unapologetic misanthropic Daniel Plainview and his young son H.W. (played by adorable newcomer Dillon Freasier whose charisma will surely garner him more roles) after they are lured by the promise of an even larger fortune in California. Once in California, Daniel meets the young man who will become his nemesis, Little Miss Sunshine’s Paul Dano who puts forth a career making performance as the deceptively meek young man who runs a Church of the Third Revelation. Dano's tyrannical hellfire and brimstone sermons and demands for more money for his congregation and the prominent fame and respect by Daniel to bless the first oil well, set about a series of catastrophic events as the two men square off against one another in their evolving relationship. With a grueling finale that recalls both the reclusive alienation of both Orson Welles’ Charles Foster Kane and twentieth century icon Howard Hughes, the narrative eventually produces the wrath and violence foreshadowed by the movie’s title. And with this, we realize that despite the Blood’s period trappings that may have made others view it as a film solely about a particular time and place, we’re instead handed a cautionary tale about the dangers of greed and paranoia in regards to the divisive hot topic issues of oil and religion with another one of Anderson’s trademark treatises on father and son dynamics thrown in for good measure. Given the dangers facing the world and our two current wars it’s no wonder that Anderson chose to make such a film, for as we see on the nightly news again and again, when you add oil to religion, there will be blood indeed.